Sikhism, or SikhiSikkhī, pronounced [ˈsɪkːʰiː], from Sikh, meaning a "disciple", "seeker," or "learner") is a religion that originated in the Punjab region in the northern part of the Indian subcontinent around the end of the 15th century, and has variously been defined as monotheistic, monistic and panentheistic. It is one of the youngest of the major world religions, and the world's fifth largest organized religion, as well as being the world's ninth-largest overall religion. The fundamental beliefs of Sikhism, articulated in the sacred scripture Guru Granth Sahib, include faith and meditation on the name of the one creator, divine unity and equality of all humankind, engaging in selfless service, striving for justice for the benefit and prosperity of all, and honest conduct and livelihood while living a householder's life. In the early 21st century there were nearly 25 million Sikhs worldwide, the great majority of them living in Punjab, according to the Encyclopaedia Britannica. Guru Nanak Gurpurab, also known as Guru Nanak's Prakash Utsav and Guru Nanak Jayanti, celebrates the birth of the first Sikh Guru, Guru Nanak. This is one of the most sacred festivals in Sikhism, or Sikhi. Katak is the eighth month of the Nanakshahi calendar. This month coincides with Kartik in the Hindu calendar and the Indian national calendar, and October and November in the Gregorian and Julian calendars and is 30 days long. Sri Guru Granth Sahib is the Sikh scriptures. It was compiled by the ten gurus of Sikhism and is itself regarded by Sikhs as the final, sovereign, and eternal living guru. 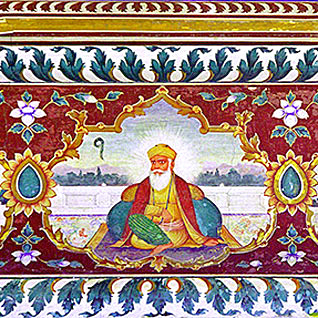 Adi Granth, the first rendition, was compiled by the fifth Sikh guru, Guru Arjan. The tenth guru, Guru Gobind Singh, added one shloka, dohra mahala 9 ang, 1429 and all 115 hymns of his father, Guru Tegh Bahadur. This second rendition came to be known as Sri Guru Granth Sahib. After Guru Gobind Singh's death in 1708, Baba Deep Singh and Bhai Mani Singh prepared many copies of the Sri Guru Granth Sahib for distribution. 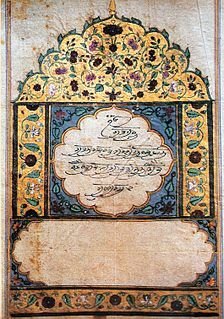 Asa Di Var is a collection of 24 pauris or stanzas written by Guru Nanak Devji .Some people argue that the founder of Sikhism, Guru Nanak Dev ji wrote the first 9 together on one occasion and later wrote 15 more stanzas on a different occasion but Professor Sahib Singh and some of the foremost Sikh scholars believe that the whole Var was written at the same place as the Var itself proceeds in a definite uniformity. The whole Var was compiled by the 5th Guru, Guru Arjan Dev ji in 1604 AD. 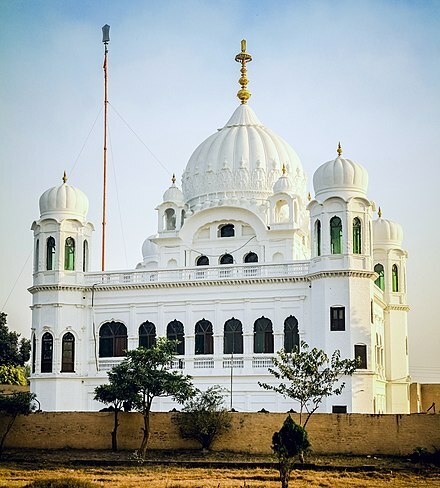 Nankana Sahib is a city and capital of Nankana Sahib District in the Punjab province of Pakistan. It is named after the first Guru of the Sikhs, Guru Nanak, who was born in the city and first began preaching here. Today it is a city of high historic and religious value and a popular pilgrimage site for Sikhs from all over the world. It is located about 91 km (57 mi) west of Lahore and about 75 km (47 mi) east of Faisalabad. The city has a population of approximately 70,000. Mehta kalu (formally Kalyan Chand Das Bedi was the father of Guru Nanak Dev, the founder and first guru of Sikhs. He was born a Hindu. Bebe Nanaki (1464–1518) was the elder sister of Guru Nanak Dev, the founder and first Guru (teacher) of Sikhism. Bebe Nanaki is an important religious figure of Sikhism, and is known as the first Gursikh. She was the first to realize her brother's "spiritual eminence". Daulat Khan Lodi was the governor of Lahore during the reign of Ibrahim Lodi, the last ruler of the Lodi dynasty. Due to disaffection with Ibrahim, Daulat invited Babur to invade the kingdom. Aleph is the first letter of the Semitic abjads, including Phoenician 'Ālep ऀ, Hebrew 'Ālef א, Aramaic Ālap ࡀ, Syriac ʾĀlap̄ ܐ, and Arabic Alif ا. It also appears as South Arabian ੱ, and Ge'ez ʾÄlef አ. One popular Janamsākhī was allegedly written by a close companion of the Guru, Bhai Bala. However, the writing style and language employed have left scholars, such as Max Arthur Macauliffe, certain that they were composed after his death. According to the scholars, there are good reasons to doubt the claim that the author was a close companion of Guru Nanak and accompanied him on many of his travels. Naam Japna : Meditating on God's name to control the five weaknesses of the human personality. Guru Gobind Singh, born Gobind Rai, was the tenth Sikh Guru, a spiritual master, warrior, poet and philosopher. When his father, Guru Tegh Bahadur, was beheaded for refusing to convert to Islam, Guru Gobind Singh was formally installed as the leader of the Sikhs at age nine, becoming the tenth Sikh Guru. His four sons died during his lifetime – two in battle, two executed by the Mughal army. Guru Angad was the second of the ten Sikh gurus. He was born in a Hindu family, with the birth name as Lehna, in the village of Harike in northwest Indian subcontinent. Bhai Lehna grew up in a Khatri family, his father was a small scale trader, he himself worked as a pujari (priest) and religious teacher centered around goddess Durga. He met Guru Nanak, the founder of Sikhism, and became a Sikh. He served and worked with Guru Nanak for many years. Guru Nanak gave Bhai Lehna the name Angad, chose Angad as the second Sikh Guru instead of his own sons. Guru Amar Das was the third of the Ten Gurus of Sikhism and became Sikh Guru on 26 March 1552 at age 73. 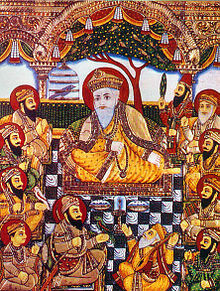 Guru Har Rai revered as the seventh Nanak, was the seventh of ten Gurus of the Sikh religion. He became the Sikh leader at age 14, on 8 March 1644, after the death of his grandfather and sixth Sikh leader Guru Hargobind. He guided the Sikhs for about seventeen years, till his death at age 31. Guru Har Krishan' was the eighth of the ten Sikh Gurus. At the age of 5, he became the youngest Guru in Sikhism on 7 October 1661, succeeding his father, Guru Har Rai. He contracted smallpox and died of the disease in 1664 before reaching his 8th birthday. Guru Tegh Bahadur was the ninth of ten Gurus of the Sikh religion. Tegh Bahadur continued in the spirit of the first guru, Nanak; his 116 poetic hymns are registered in Guru Granth Sahib. Guru Tegh Bahadur resisted the forced conversions of Kashmiri Pandits and non-Muslims to Islam, and was publicly beheaded in 1675 on the orders of Mughal emperor Aurangzeb in Delhi for himself refusing to convert to Islam and saving Kashmiri Pandits and other non-Muslims or as viewed by Muslims that he was condemned to death for waging war but was offered at last moment that reverting to Islam will save him, which he declined as he wanted to be in Sikh rehat till his last breath. Gurudwara Sis Ganj Sahib and Gurdwara Rakab Ganj Sahib in Delhi mark the places of execution and cremation of the Guru's body. The martyrdom of Guru Tegh Bahadur is remembered as the Shaheedi Divas of Guru Tegh Bahadur every year on 24 November, according to the Nanakshahi calendar released by the Shiromani Gurdwara Parbandhak Committee in 2003. Jaap Sahib is the morning prayer of the Sikhs. The prayer was composed by the tenth Sikh Master, Guru Gobind Singh and is found at the start of the Sikh scripture Dasam Granth. This Bani is an important Sikh prayer, and is recited by the Panj Pyare while preparing Amrit on the occasion of Amrit Sanchar (initiation), a ceremony held to admit initiates into the Khalsa and it is a part of a Sikh's Nitnem. The Jaap Sahib is reminiscent of Japji Sahib composed by Guru Nanak, and both praise God. Haumai is the concept of self-centeredness in Sikhism. This concept was taught by Guru Nanak, the founder of Sikhism, as the source of five evils: lust, covetousness, wrath, pride and attachment. According to Sikh Gurus teachings, it is Haumai that leads to endless cycles of transmigration (rebirth), and makes a person "manmukh". They state that one must turn away from Haumai, become a "gurmukh" and follow the path of the Guru to receive God's grace. Hinduism and Sikhism are both Dharmic religions that originated in the Indian Subcontinent. Hinduism is an older religion, while Sikhism was founded in the 15th-century by Guru Nanak. Guru Ram Das was the fourth of the ten Gurus of Sikhism. He was born on 24 September 1534 in a poor Hindu family based in Lahore, part of what is now Pakistan. His birth name was Jetha, he was orphaned at age 7, and thereafter grew up with his maternal grandmother in a village. Sikhism has prohibited idol worship since early 20th century, led by the Tat Khalsa of the Singh Sabha Movement of late 19th-century. Prior to 1905, idols were a part of Sikh gurudwaras, including the Harimandir Sahib. According to Namdhari sect of Sikhism, it was Khalsa sect of Sikhism led Shiromani Gurdwara Prabandak Committee that invented phrases such as "Guru Maniyo Granth" in 1925 to remove idol worship within the Sikh community. Guru Arjan 15 April 1563 – 30 May 1606) was the first of the two Gurus martyred in the Sikh faith and the fifth of the ten total Sikh Gurus. He compiled the first official edition of the Sikh scripture called the Adi Granth, which later expanded into the Guru Granth Sahib. Guru Granth Sahib Ji, is the central religious text of Sikhism, considered by Sikhs to be the final sovereign Guru of the religion. It contains 1430 Angs (pages), containing hymns of 36 saint mystics which includes Sikh guru sahiban, Bhagats, Bhatts and gursikhs. It is the only religious script in the world that contains views and ideology of people of other religions, castes and creeds. It also contains teachings of Sikh gurus themselves and was written by Bhai Gurdas Ji and by Bhai Mani Singh Ji. Minas (ਮੀਣੇ) is a term coined by orthodox Sikhs for a sect of Sikhism that followed Baba Prithi Chand (1558–1618), the eldest son of Guru Ram Das after the younger brother Guru Arjan was officially made the next Guru. Minas were shunned by orthodox Sikhs, declared as one of the five Panj Mel that a Sikh must avoid by Guru Gobind Singh, and the term itself has a derogatory meaning of "scoundrels". An alternate non-derogatory term for them has been the Miharvan Sikhs. 1 2 Dawe, Donald G. "Srī Gurū Nānak Dev". Encyclopaedia of Sikhism. Punjabi University Patiala. Retrieved 18 August 2015. ↑ Sidhu, Dawinder (2009). Civil Rights in Wartime: The Post-9/11 Sikh Experience. Ashgate Publishing, Ltd. p. 26. ISBN 9781409496915. 1 2 3 Macauliffe, Max Arthur (2004) . The Sikh Religion — Its Gurus, Sacred Writings and Authors. India: Low Price Publications. ISBN 81-86142-31-2. ↑ "Guru Nanak Sahib, Guru Nanak Ji, First Sikh Guru, First Guru Of Sikhs, Sahib Shri Guru Nanak Ji, India". Sgpc.net. Archived from the original on 18 February 2012. Retrieved 9 August 2009. ↑ "The Bhatti's of Guru Nanak's Order". Nankana.com. Archived from the original on 16 June 2013. Retrieved 9 August 2009. ↑ Cole, W. Owen; Sambhi, Piara Singh (1978). The Sikhs: Their Religious Beliefs and Practices. London: Routledge & Kegan Paul. p. 9. ISBN 0-7100-8842-6. 1 2 3 "Guru Nanak: A brief overview of the life of Guru Nanak, the founder of the Sikh religion". ↑ Madanjit Kaur. "Udasi". Encyclopaedia of Sikhism. Punjabi University Patiala. Retrieved 17 September 2015. ↑ "Sikh Gurus". Sikh-history.com. Retrieved 2016-03-11. ↑ Singh, H. S. (2000). The Encyclopedia of Sikhism. Hemkunt Press. ISBN 9788170103011 . Retrieved 27 May 2017. 1 2 Mandair, Arvind-Pal Singh (2009). Religion and the Specter of the West - Sikhism, India, Postcoloniality and the Politics of Translation. Columbia University Press. pp. 372–373. ISBN 0231147244. ↑ Nayar, Kamal Elizabeth; Sandhu, Jaswinder Singh (2007). The Socially Involved Renunciate - Guru Nanaks Discourse to Nath Yogi's. United States of America: State University of New York Press. p. 106. ↑ Kaur Singh; Nikky Guninder (30 Jan 2004). Hindu spirituality: Postclassical and modern (Editors: K. R. Sundararajan, Bithika Mukerji). English: Motilal Banarsidass. p. 530. ISBN 8120819373. ↑ Marwha, Sonali Bhatt (2006). Colors of Truth, Religion Self and Emotions. New Delhi: Concept Publishing Company. p. 205. ISBN 818069268X. ↑ W. H. McLeod (2009). The A to Z of Sikhism. Scarecrow Press. pp. 139–140. ISBN 978-0-8108-6344-6. 1 2 David Lorenzen (1995), Bhakti Religion in North India: Community Identity and Political Action, State University of New York Press, ISBN 978-0791420256, pages 1-2, Quote: "Historically, Sikh religion derives from this nirguni current of bhakti religion"
1 2 Louis Fenech (2014), in The Oxford Handbook of Sikh Studies (Editors: Pashaura Singh, Louis E. Fenech), Oxford University Press, ISBN 978-0199699308, page 35, Quote: "Technically this would place the Sikh community's origins at a much further remove than 1469, perhaps to the dawning of the Sant movement, which possesses clear affinities to Guru Nanak's thought sometime in the tenth century. The predominant ideology of the Sant parampara in turn corresponds in many respects to the much wider devotional Bhakti tradition in northern India." ↑ Grewal, JS (October 1998). The Sikhs of the Punjab. United Kingdom: Cambridge University Press. pp. 28 onwards. ISBN 0521637643. 1 2 Singha, HS (30 May 2009). Sikhism : A Complete Introduction. New Delhi, India: Hemkunt Press. p. 8. ISBN 8170102456. ↑ Pruthi, R K (2004). Sikhism and Indian Civilization. New Delhi: Discovery Publishing House. pp. 202–203. ISBN 9788171418794. ↑ Louis Fenech (2014), in The Oxford Handbook of Sikh Studies (Editors: Pashaura Singh, Louis E. Fenech), Oxford University Press, ISBN 978-0199699308, page 36, Quote: "Few Sikhs would mention these Indic texts and ideologies in the same breadth as the Sikh tradition, let alone trace elements of their tradition to this chronological and ideological point, despite the fact that the Indic mythology permeates the Sikh sacred canon, the Guru Granth Sahib and the secondary canon, the Dasam Granth (Rinehart 2011), and adds delicate nuance and substance to the sacred symbolic universe of the Sikhs of today and of their past ancestors." ↑ Singh, Kirapala; Kapur, Prithipala (2004). Janamsakhi tradition: an analytical study. Singh Brothers. p. 174. Retrieved 27 May 2017. ↑ Harjinder Singh Dilgeer (2008). Sikh Twareekh. Belgium & India: The Sikh University Press. ↑ Jagbir Johal (2011). Sikhism Today. Bloomsbury Academic. pp. 125 note 1. ISBN 978-1-84706-272-7. 1 2 3 4 5 Winand M. Callewaert; Rupert Snell (1994). According to Tradition: Hagiographical Writing in India. Otto Harrassowitz Verlag. pp. 26–27. ISBN 978-3-447-03524-8. 1 2 3 David N. Lorenzen (1995). Bhakti Religion in North India: Community Identity and Political Action. State University of New York Press. pp. 41–42, context: 37–43. ISBN 978-0-7914-2025-6. ↑ WH McLeod (2007). Essays in Sikh History, Tradition and Society. Oxford University Press. pp. 42–44. ISBN 978-0-19-568274-8. ↑ WH McLeod (2004). Sikhs and Sikhism. Oxford University Press. pp. 127–131. ISBN 978-0-19-566892-6. ↑ Mahinder N. Gulati (2008). Comparative Religious And Philosophies : Anthropomorphlsm And Divinity. Atlantic Publishers. pp. 316–319. ISBN 978-81-269-0902-5. ↑ Winand M. Callewaert; Rupert Snell (1994). According to Tradition: Hagiographical Writing in India. Otto Harrassowitz Verlag. pp. 27–30. ISBN 978-3-447-03524-8. ↑ Harjot Oberoi (1994). The Construction of Religious Boundaries: Culture, Identity, and Diversity in the Sikh Tradition. University of Chicago Press. p. 55. ISBN 978-0-226-61593-6.